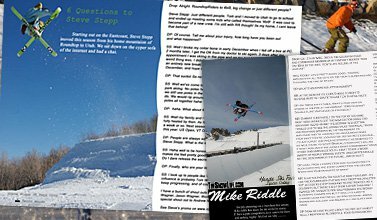 As can probably be guessed from the random timing of this issue, Drop was one of those spur of the moment impulse decisions; it is our first time writing or editing a magazine. What we wanted was not something where we gave all our opinions to you but rather a magazine written off the basis of interviews so that those at the centre of riding and the industry could say what they thought directly. We&rsquo;re also a British based magazine and that is very important to us. So while the sport is largely centred in the U.S, Canada and Europe we hope you guys will be interested to check out &nbsp;all the British riders and stuff in this issue! Finally, to read the flash version just right click and press zoom in, and then to zoom out right click and press show all. P.S. thanks to Newschoolers.com for helping us out and also to all the guys who gave us their time to do the interviews!